At Waterloo Heights Dental General Dentistry, we practice a preventive model of dentistry. We seek to address the underlying causes of oral and overall health issues so we can treat the problem at the source, rather than just treating your symptoms. Don’t get us wrong, we love having you in our chair and seeing your smiling face, but our goal is to provide a level of preventive care and education so you won’t have to come back and see us except for your regular cleanings and exams. We hate to sound cliché, but oral hygiene really is one of the most important factors when it comes to your oral health. Although we do have one of the best hygiene teams in West Salem, we usually only see you in our office twice per year for your regular cleanings and exams. The rest of the year it’s up to you to keep your mouth clean and healthy. We will give you a gentle and thorough cleaning to take care of any plaque or tartar buildup, but it’s up to you to establish and maintain a good oral hygiene routine at home if you want to avoid more painful and costly complications down the road. We place a strong emphasis on patient education to give you the knowledge and the tools you need to take your health into your own hands. Knowledge is power! Invest in an electric toothbrush. We recommend Sonicare® for the most advanced cleaning power. Change brush heads every three months because bacteria can build up quickly. Floss every day. Curve the floss in a c-shape around each tooth and under the gums rather than snapping it up and down. Release a new section of floss for each tooth to avoid re-depositing plaque and bacteria. If traditional string floss doesn’t work for you, there are other options available. We recommend Soft-Picks® which are soft and gentle and easy to use. If you suffer from tooth decay, gingivitis or gum disease, we highly recommend using CariFree® products. CariFree can help eliminate the oral pathogens that cause these problems while reducing acidity and balancing the pH of your mouth for a healthier environment. Did you know that most American adults suffer from some level of gum disease, or that gum disease is the leading cause of tooth loss for adults? What’s more alarming is that the same oral pathogens that cause gum disease can also trigger heart attacks, strokes, and many other serious systemic diseases. If your gums are bleeding during regular brushing and flossing, we’re sorry to tell you, you have gum disease. So, what is gum disease? Gum disease is an oral infection that is caused by oral pathogens or “bad bacteria” that live in your mouth. The early stage of gum disease is called gingivitis, but as the disease progresses it becomes more serious and is known as periodontal disease or periodontitis. Gum disease is characterized by bleeding, swollen or inflamed gums. Left untreated, the gums will start to recede or pull away from the teeth, and deep pockets form allowing the infection to flourish. Eventually, gum disease can cause tooth loss. So, what can we do? 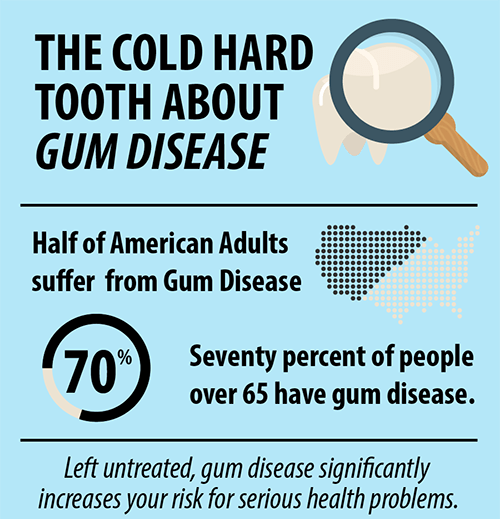 Depending on the severity of your case, we have a number of treatment options to help get gum disease under control. If it’s still in the gingivitis stage, we will recommend more diligent oral hygiene and using CariFree products to brush and rinse. We will want to see you more regularly to monitor the disease and perform laser cleanings and oral disinfection. If your gum disease has progressed and you’ve lost gum tissue to gum recession, we may need to perform gum surgery to replenish the tissue and protect your teeth. While more diligent brushing and flossing will help maintain a cleaner, healthier environment in the mouth, it won’t kill the infection. Remember, gum disease is an infection and should be treated as such. Think about it this way: if you have gum disease, you essentially have an open wound in your mouth. Would you treat an open wound with a brush and some floss or a sharp tool to scrape it clean? We sure hope not, yet dentists have been using these techniques to treat gum disease since the beginning of dentistry. Oral disinfection is the only way to treat the pathogens that are causing the problem, and Waterloo Heights is one of a small handful of dentists in the country that offers this kind of treatment. This open wound – your bleeding gums – leaves a direct pathway for these bacteria to enter the bloodstream and flow directly to your main lifeline – your heart. Gum disease can significantly increase your risk for many other serious systemic diseases including heart disease, stroke, diabetes, Alzheimer’s, the list goes on. Oral cancer is unfortunately on the rise in the United States, but your West Salem dentist is in a unique position (inside your mouth!) to detect and diagnose oral cancer in the early stages before it progresses. Early diagnosis is essential to ensure your best chance at survival and recovery. 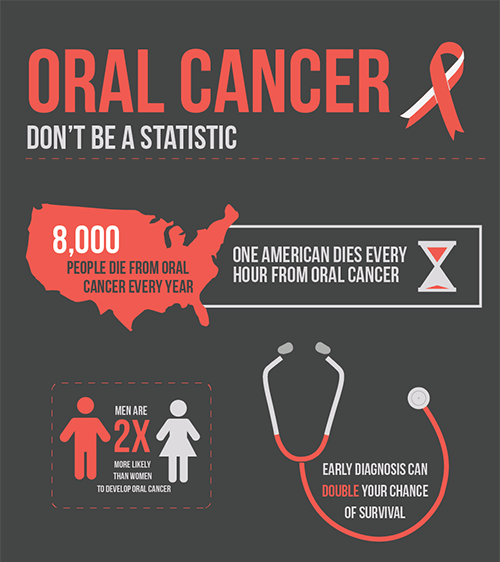 Oral cancer screenings are one of the many reasons you should see us regularly for a thorough examination. We are always on the lookout for any changes or abnormalities in your mouth that may be signs of oral cancer, and you should be on the lookout yourself as well. If you or your little one is involved in any type of contact sports, a custom mouthguard can offer unmatched protection against tooth loss, soft tissue injuries, and can even lessen the damage of concussions. Yes, there are stock mouthguards you can buy at the local sporting goods store, but only a custom mouthguard from Waterloo Heights offers the best fit (so it will actually be worn) and the highest level of protection. If you clench and grind your teeth at night or suffer from TMJ/TMD, a custom mouthguard or night guard can lessen the damage to your teeth and give your jaw joint the time it needs to rest and recover. Wearing a mouthguard while you sleep allows you (and your mouth) to get a better night’s rest so you can wake up feeling refreshed, pain-free, and ready to tackle the day. Come see us today to be fitted for a custom mouthguard to give your best asset – your healthy smile – the protection it deserves. At Waterloo HeightsDental, Dr. Shih and our team LOVE seeing kids in our office. Aside from the adorable and silly things things that come out of their mouths sometimes, we’re more interested in what’s going on inside. Where most adults are settled in their ways, kids are just beginning to develop, and we want to take the opportunity to educate them on the importance of oral health and form a positive relationship with the dentist. First, we will make sure they feel completely comfortable. We will talk them through our cleaning and exam process, and show them some of the tools and how we use them so there is no questions or fears. Our hygienists are very gentle, especially with the little ones so they don’t leave with sore gums or bad feelings about the dentist. Pediatric dental care is essential to set the stage for a lifetime of healthy smiles. If you’re ready to experience the difference of a dentist that genuinely cares about your overall health and well-being, you’ve come to the right place. Contact your West Salem dentist, Dr. Priscilla Shih at Waterloo Heights today.